← AAS release Turmoil District for Chromaphone 2 / And Promos ! 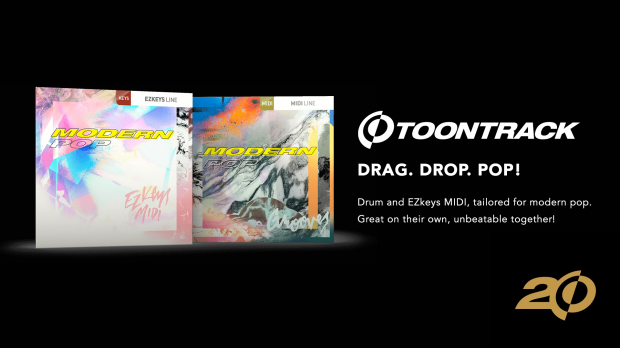 Toontrack release Modern Pop Grooves & EZkeys MIDI. Available now for 20% off at only $23 bucks during Toontrack’s 20 year celebration sales! Get Toontrack’s Modern Pop Grooves & EZkeys MIDI Here ! Modern Pop EZkeys MIDI : Designed to give you a broad baseline of chord progressions and melodic structures to spark your next batch of keys-driven, contemporary modern pop songs. Modern Pop Grooves : A collection of grooves and fills, perfect for any curious and creative songwriter looking for a palette of new foundational ideas. This entry was posted in DontCrack, Event, Promotions, Sounds and tagged Chords, Contemporary, Drums, EZdrummer 2, EZKeys, Fills, Grooves, Keyboard, Keys, Melodic, MIDI, Modern Pop, Piano, Pop, Progressions, Songwriter, Superior Drummer 3, Toontrack. Bookmark the permalink.